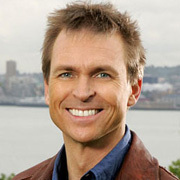 Phil Keoghan's love of travel began early. Later it would help him become a vital cog in one of reality TV's biggest successes. Though Keoghan is far from the first New Zealander to work in Hollywood, his gig as presenter of The Amazing Race makes him one of the few Kiwis to have made it big on American network television. Born in the Canterbury town of Lincoln, Keoghan was roughly three years old when his family began an extended period overseas: first to Canada, then Antigua in the Carribean, where his plant scientist father set up a project looking for sustainable feed for local livestock. His mother taught commerce at a local high school, and also had over 80 music students. By the time Keoghan returned to high school in Christchurch, he was "bitten by the travel bug". Starting a television apprenticeship, he was soon picked to work as a Film Camera Assistant to veteran cameraman Wayne Williams. By the age of 19, Keoghan had crossed the line: following a small acting role on Gloss he was invited to join the presenting team on magazine show Spot On. The show proved life-changing: or more precisely one of his first Spot On assignments, when he joined a salvage diver inside the sunken Mikhail Lermontov. Left alone in the darkened ballroom while waiting for the missing camera crew to appear, Keoghan panicked after realising that he could die. Pulled out of of the wreck by his dive buddy, he resolved to face his fear, and return to the wreck the following day. "I decided right there and then that I would live life to the fullest," he writes in book No Opportunity Wasted. "It was the first time I really stopped to think what dying could mean. I grabbed a pen and paper and wrote down all the things I had to do in life: hand-feed sharks, travel the world, climb Mt Everest, go into space. " After the "wake-up call" of a near drowning, Keoghan got busy. Aside from working on his bucket list, he was gaining screen experience on morning television (TV3's Ya Hoo), afternoon (3.45 Live) and primetime (That's Fairly Interesting). He also presented for teen show LIFE, and junior sports programme Short Sportz. A Keoghan's Heroes slot, which introduced varied adventure-seekers, first appeared as part of Mobil Sports. A later version of the idea would be internationally syndicated, and appear as an occasional slot on CBS News. In 1992 Keoghan headed for the United States. Lacking the green card that would allow him to take up a job offer to work at MTV, he combined forces with a local cameraman to work on an environmental project in the Florida Everglades. Later he covered 100s of stories during four years on a FOX morning show, worked on location around the world for Discovery Channel shows like Phil Keoghan's Adventure Crazy, and hosted specials for channels CBS, VH1 and AMC. In 2000 he auditioned for two new shows — Survivor and The Amazing Race — and returned home to co-host TV Two viewer participation show Whose House is it Anyway? When he won the job to host Amazing Race, Keoghan had already worked in around 60 countries. The list was about to get a lot longer. The show's longevity owes much to its basic idea (originally dreamt up in five minutes as a bet by the show's producers): international travel becomes competitive sport, with paired contestants progressively eliminated en route if they are too slow. The Amazing Race has taken the Emmy Award for outstanding reality programme every year since the category was created, apart from 2010 and 2013 (when Top Chef and The Voice respectively stole the crown). Despite the awards and extensive critical praise, the show came close to cancellation more than once during its first four seasons. Keoghan argues season five marked the tipping point, where he found himself regularly recognised and "suddenly we became water cooler talk". The logistical challenges of The Amazing Race leave little opportunity for cast or crew to sightsee, or sleep much once they have left home. Keoghan has described it as the toughest hosting assignment of his career. An Australian version of the show, hosted by Grant Bowler, launched in 2011. In 2004 Keoghan released motivational book No Opportunity Wasted, co-written with American journalist Warren Berger. A multi-award-winning TV series of the same name screened that year on Discovery Channel in the States: contestants were given 72 hours, a clear schedule and $3000 to achieve a long-held dream or desire. The idea was to sweep aside any excuses of lacking time or money, reflecting Keoghan's belief that procrastination is the biggest enemy to fulfilling dreams. Keoghan later brought the NOW TV format to New Zealand (2006) and Canada (2007). Keoghan also helped create National Geographic technology show The Human Edge, worked on the pilot of an entertainment show for Miramax, and interviewed fellow conquerers of Everest for four-part series After the Climb. In 2009 Keoghan kicked off a cycle ride from Los Angeles to New York City, in a multi-pronged mission to challenge himself, spend quality time with his father, and ultimately raise a million dollars for America's National Multiple Sclerosis Society. The 40 day, 5300 kilometre adventure is captured in feature-length documentary The Ride, which screened on America's Showtime network, after fundraising screenings in US cinemas. In 2013 Keoghan followed it with a ride tracing the route of the 1928 Tour de France. This time Keoghan and friend covered 5600km on a vintage bike, with no gears. The corresponding documentary, Le Ride, got its world premiere at the 2016 Christchurch Film Festival. It tells the story of Kiwi Harry Watson, part of the first English-speaking team to compete in the tour. Alongside his stack of Emmys for The Amazing Race plus a trio of different awards for NOW, Keoghan is also the recipient of an MNZM in the 2014 New Year Honours, a 2012 Sir Peter Blake Emerging Leader Award, and a Dorothy Corwin Spirit of Life Award for services to multiple sclerosis.